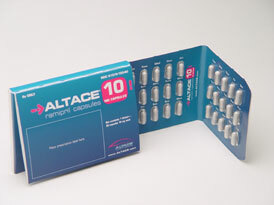 Side effects of Ramipril (Altace) are typically mild and do not occur in the majority of patients taking it. The most common side effects are dizziness and nausea. These are typically manageable with minor changes to the patient’s lifestyle, diet and habits. More serious side effects of ramipril can include fainting, chest pain, severe swelling or symptoms of liver problems. If you experience any adverse side effects with this medication, you should report them to your doctor immediately for evaluation and further treatment. In most cases, side effects will gradually go away as the body adjusts to the medication. If you notice your side effects worsening, persisting or interfering significantly with your day to day activities, you should consult your doctor. You may be able to solve these issues by adjusting the dosage of the medication. Other serious Ramipril side effects that are not related to an allergic reaction may occur. These should be brought to the attention of a healthcare provider. Side effects in pregnancy are severe and can be fatal to the unborn baby. It is essential that you take the appropriate steps to prevent pregnancy while taking this medication. Your doctor will be able to provide you with detailed information on the best and safest ways to prevent pregnancy. If you believe that you are pregnant, contact your doctor immediately. If you are stung by a wasp or bee, it is important to let your doctor, or any individual treating you, know that you are taking ramipril. The sting itself will not cause any side effects. However, the injection provided for a bee or wasp allergy can result in a serious reaction. Always let your healthcare provider know what medications you are already taking before you allow them to prescribe more. Dizziness is very common among side effects experienced by patients taking Ramipril. When first starting this medication, you should not drive or operate heavy machinery until you are able to evaluate how ramipril medications will affect you. Use alcoholic beverages in moderation as these will only intensify such side effects. To control and reduce dizziness, rise slowly and move to a sitting position first before you get up when lying down. Dizziness is more pronounced in older patients than in younger ones. Nausea and vomiting are two of the more common side effects that patients report. One of the greatest hazards with these side effects is the potential for dehydration. Be sure to drink plenty of fluids even if you feel nauseous. Replenish your fluids diligently if you are experiencing vomiting. Dehydration will intensify dizziness associated with ramipril and may perpetuate the cycle of nausea and vomiting. Ramipril (Altace) is typically very effective for treating conditions associated with high blood pressure. For the majority of patients, side effects are mild and very manageable. The most important consideration on this medication is avoiding pregnancy. Most other side effects of ramipril and Altace will not affect patients taking the drug in a significant way.